Resource Scheduling - Can we output the schedule to html web pages for our own website? All Topics > Desktop Version > Can we output the schedule to html web pages for our own website? We provide a full online service, separate to our desktop product, to allow access to your online or shared desktop data via our online interface but the desktop software can also output simple web pages for a short term snap shot view that you can host and manage which is detailed below. 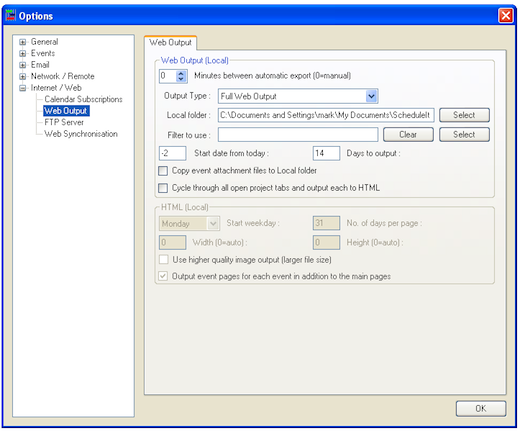 The feature 'Output to Web Pages' allows your schedule to be output to web pages which you can store and host anywhere. You can customise the templates used and integrate the pages into your website. The output to web pages can be made manually from the Tools menu any time or set to output automatically at timed intervals. The full web output allows inline viewing of the events, opening and closing of the visible groups, filtering of the resources and events in view and the ability to navigate to any point in time using the popup date selector or navigation arrows all with only a web browser. From the menu Tools/Options/Internet/Web Output, you can set the output path, filter used and the number of days back and forward in time from which events should be added to the generated pages. Note: As your browser is dynamically creating your live schedule as you navigate the loading performance can depend on your chosen browser. Substantial performance differences can be seen when comparing older and newer browsers, and browsers from different suppliers. 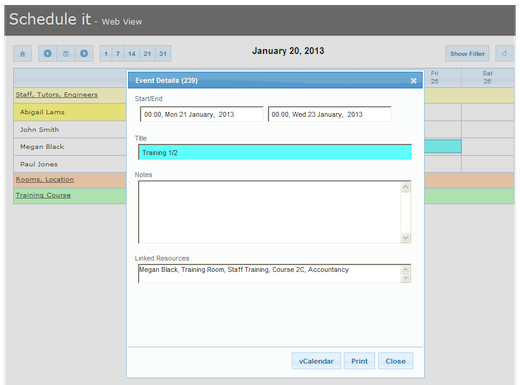 Notes: Schedule it desktop can share data externally with 3 resources output to HTML. This is increased in multiples of 3 for every additional license purchased. Additional licenses can be purchased to support a higher number of resources. E.g. 10 desktop licenses can support 10 Schedule it users and 30 resources in a web output. Bulk license packs are available which give unlimited sharing and removes the 3:1 limitations.